With over 30 plugins hand-picked especially for sound designers and post production facilities, the Waves Sound Design Suite is a comprehensive and cost-effective collection of audio plugins that provides all the essentials—without breaking the bank. And to be sure we included the perfect plugins for sound design, Waves worked closely with two of the hardest-working pros in the business: movie maven Scott Martin Gershin(Star Trek, Hellboy 2, Chronicles of Riddick, American Beauty) and game guru Charles Deenen(Need for Speed, Fast & Furious 1and2). 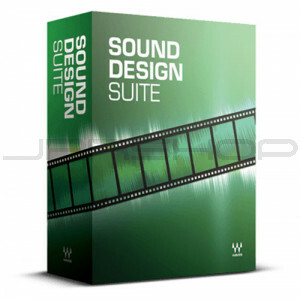 From conventional effects to creative sonic textures, Sound Design Suite covers all your bases. With compression, EQ, pitch shifting, level maximization, and more, you get everything need to mold, modulate, and mangle your sound. If you've been looking for an all-in-one, off-the-shelf audio processing solution, Sound Design Suite is it—no more mixing and matching plugins from different bundles.